Eye On Tampa Bay: Can Nelson handle the Truth about ObamaCare? We have all been wondering Where in the world is Senator Bill Nelson on ObamaCare Now? We've heard crickets from him as issues swirl all around it's implementation. Apparently our local media isn't curious either but we know you are. Let's be clear: If you have health insurance now, you can keep it. 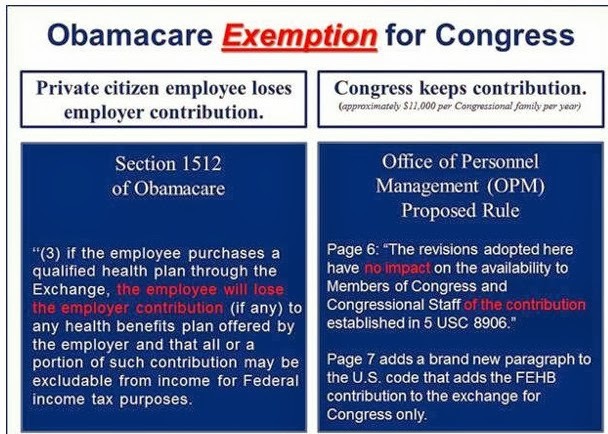 Members of Congress did not exempt themselves from any part of this law. Fast forward to 2013 and today. We have watched Obama unilaterally and unconstitutionally decide what parts, and when, of the ObamaCare law Obama signed he will enforce. We have watched as special interests and special groups, as well as Congress, carved out their own ObamaCare exemptions. We have watched as UPS dropped 15,000 spouses from their employer healthcare. We have watched as employees of Walgreens and other companies, as well as retirees of IBM, will no longer have the healthcare plans they currently have, but will be moved into healthcare exchanges. We have watched company after company after company reduce employee hours to part time 29 hours a week to avoid the pain of ObamaCare. We have watched as our economy is now turning into the ObamaCare economy of part time workers. Even the unions are mad as they see ObamaCare is destructive to their own self-interests and what Americans have always understood as a normal full time job - the 40 hour work week. We now know Nelson's statement in 2012 that those who currently have health insurance can keep it with ObamaCare is absolutely false. What does Senator Nelson say to those who are losing the health insurance they currently have? Does he care? “As you have no doubt read, President Obama recently issued a special rule for Congress only. Under it, Congress and congressional staff get a special subsidy to purchase health insurance on the Obamacare Exchange unavailable to every other American at similar income levels,” he said. “That special subsidy is worth approximately $11,000 per family." A majority of Floridians have always opposed ObamaCare. In fact, a greater percentage oppose it today since we now know what's in it than when the totally partisan ObamaCare bill passed in 2010 (thru a corrupt process of back room deals). But where is Senator Nelson now? He's Missing In Action on ObamaCare! Recently Nelson aide Lisa Marshall in Nelson's Orlando office adamantly said Nelson believes "Everything is ready for October 1". Really? Is ObamaCare even ready for Prime Time? Americans are worried about the security and privacy issues with the ObamaCare implementation and this Weekly Standard article confirms our worries. An ObamaCare exchange employee in Minnesota accidentally sent out an email containing 2400 American's Social Security numbers. “Users of the exchange will need to provide sensitive information, including Social Security numbers, that will be sent to a federal hub to verify such things as citizenship and household income…. “All states and the federal government, which also is setting up exchanges for some states, are scurrying to get the complex system running in less than three weeks. “‘The people who believe in this are so driven that there’s a subcontext of “Just let us do our job and get as many people signed up as possible, and we’ll pick up the debris later,”’ said Steve Parente, a University of Minnesota finance professor who specializes in health IT issues. “Parente testified on Capitol Hill earlier this week, urging caution in pushing the federal hub online before it has been thoroughly tested.The Star Tribune reports that the recipient of the mishandled privacy data was applying to become an Obamacare “navigator." And get this - there's no validation in place for eligibility for the subsidies so we're all on the honor system....really....no waste, no fraud there I'm sure. Florida's insurance officials are predicting that health insurance rates will rise 5 to 20 percent for small businesses and 30 to 40 percenin the individual market through the state's new exchange. the experts working for Medicare’s actuary have (yet again) reported that in its first 10 years, Obamacare will boost health spending by “roughly $621 billion” above the amounts Americans would have spent without this misguided law. 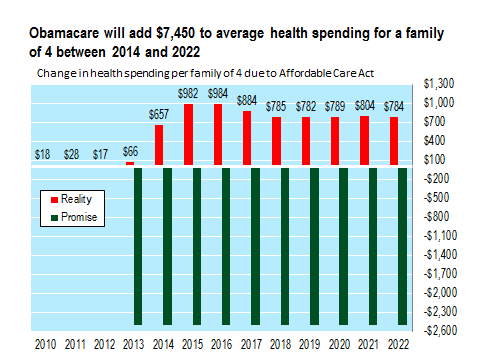 Between 2014 and 2022, the increase in national health spending (which the Medicare actuaries specifically attribute to the law) amounts to $7,450 per family of 4. In addition, the Cleveland Clinic, the very model that Obama touted in 2009, is cutting it's budget by $300 million due to ObamaCare - that means thousands of jobs lost too. What does Senator Nelson say to those losing their jobs, about company layoffs or companies not hiring simply because of ObamaCare? Does he care? We speculate Senator Nelson and the Democrats are quietly sitting on the side lines anxiously waiting for the taxpayer subsidies to start flowing, hopeful that once they flow they will never stop. Senator Nelson is being allowed to sit quietly because the media refuses to confront him about the ObamaCare train wreck he helped create. But with $17 Trillion of direct debt, our other entitlements Medicaid, Medicare and Social Security approaching life support, health insurance premiums going up, do you think the ObamaCare subsidies are even sustainable? But lo and behold federal flood insurance rates are going up just like health care premiums. Federal flood insurance affects about 2% or 2 million Floridians while ObamaCare affects all 20 million of us in Florida. And guess who wants to delay any increase in federal flood insurance rates? None other than Senator Bill Nelson. Now the Tribune did catch up with Nelson to report on his position on flood insurance rates. But where in the world is Senator Nelson on ObamaCare now? Don't you think it's about time our local media asked him? Nelson's constituents want to know. 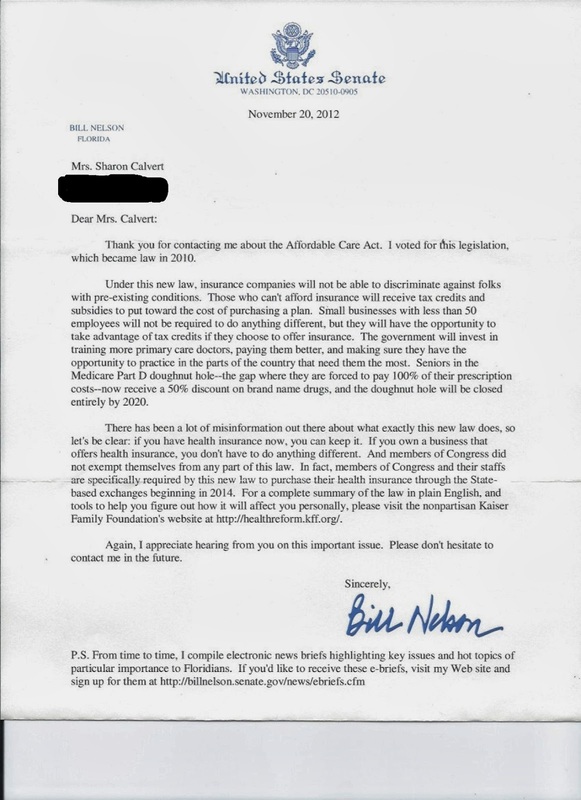 Or is Nelson getting a "free media pass" on ObamaCare?